Proprietary Name: Bimatoprost What is the Proprietary Name? Non-Proprietary Name: Bimatoprost What is the Non-Proprietary Name? Bimatoprost with NDC 68083-296 is a a human prescription drug product labeled by Gland Pharma Limited. The generic name of Bimatoprost is bimatoprost. The product's dosage form is solution/ drops and is administered via ophthalmic form. FDA Application Number: ANDA210126 What is the FDA Application Number? 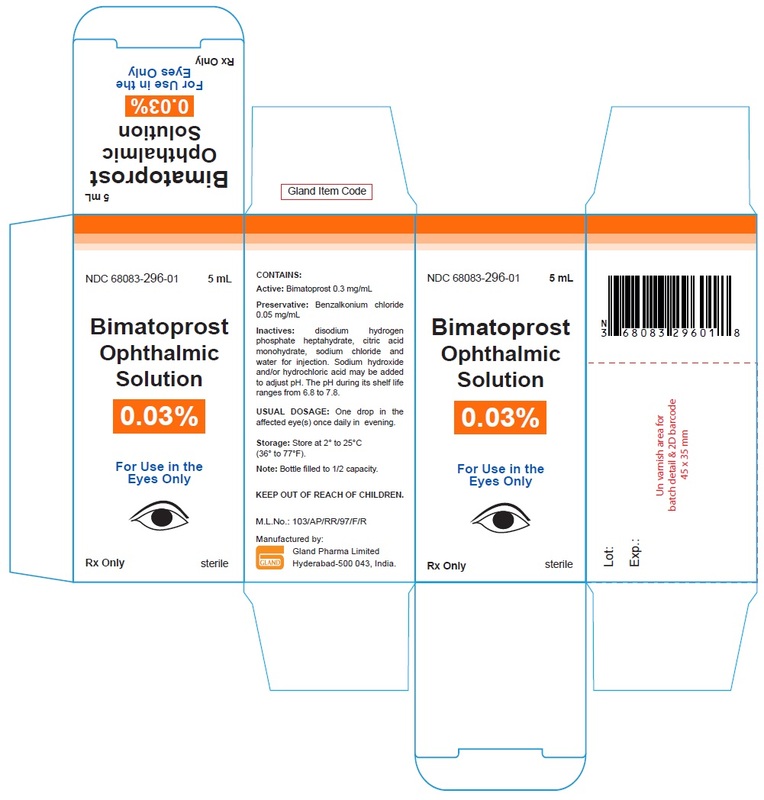 Bimatoprost ophthalmic solution, 0.03% is indicated for the reduction of elevated intraocular pressure in patients with open angle glaucoma or ocular hypertension. The recommended dosage is one drop in the affected eye(s) once daily in the evening. Bimatoprost ophthalmic solution, 0.03% should not be administered more than once daily since it has been shown that more frequent administration of prostaglandin analogs may decrease the intraocular pressure lowering effect. Reduction of the intraocular pressure starts approximately 4 hours after the first administration with maximum effect reached within approximately 8 to 12 hours. Bimatoprost ophthalmic solution, 0.03% may be used concomitantly with other topical ophthalmic drug products to lower intraocular pressure. If more than one topical ophthalmic drug is being used, the drugs should be administered at least five (5) minutes apart. Ophthalmic solution containing bimatoprost 0.3 mg/mL. 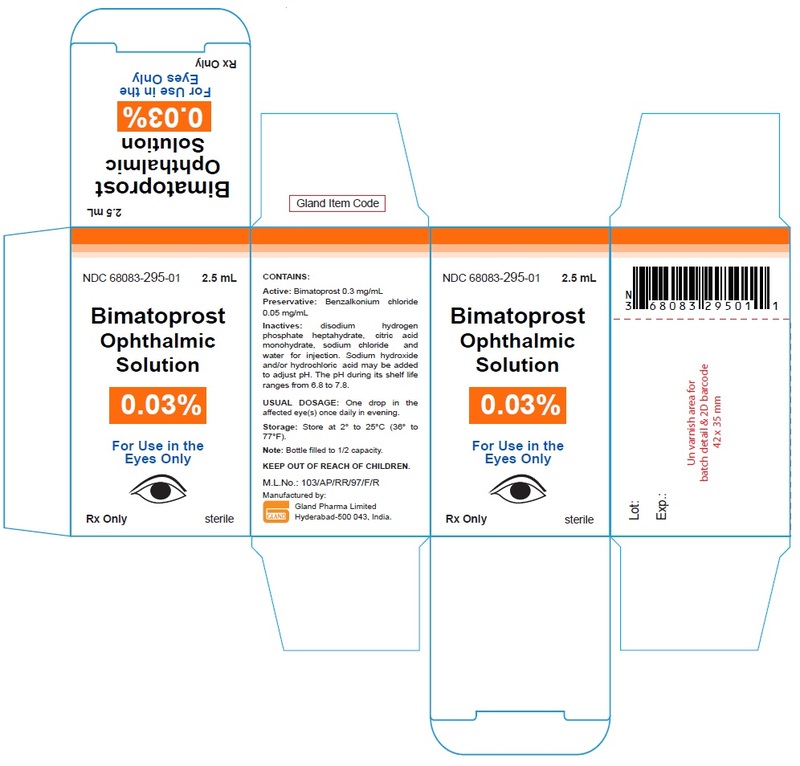 Bimatoprost ophthalmic solution, 0.03% is contraindicated in patients with hypersensitivity to bimatoprost or to any of the ingredients [see Adverse Reactions (6.2)]. Bimatoprost ophthalmic solution has been reported to cause changes to pigmented tissues. The most frequently reported changes have been increased pigmentation of the iris, periorbital tissue (eyelid) and eyelashes. Pigmentation is expected to increase as long as bimatoprost is administered. The pigmentation change is due to increased melanin content in the melanocytes rather than to an increase in the number of melanocytes. After discontinuation of bimatoprost, pigmentation of the iris is likely to be permanent, while pigmentation of the periorbital tissue and eyelash changes have been reported to be reversible in some patients. Patients who receive treatment should be informed of the possibility of increased pigmentation. The long term effects of increased pigmentation are not known. Iris color change may not be noticeable for several months to years. Typically, the brown pigmentation around the pupil spreads concentrically towards the periphery of the iris and the entire iris or parts of the iris become more brownish. Neither nevi nor freckles of the iris appear to be affected by treatment. While treatment with bimatoprost ophthalmic solution, 0.03% can be continued in patients who develop noticeably increased iris pigmentation, these patients should be examined regularly [see Patient Counseling Information, (17)]. Bimatoprost ophthalmic solution, 0.03% may gradually change eyelashes and vellus hair in the treated eye. These changes include increased length, thickness, and number of lashes. Eyelash changes are usually reversible upon discontinuation of treatment. Macular edema, including cystoid macular edema, has been reported during treatment with bimatoprost ophthalmic solution. Bimatoprost ophthalmic solution, 0.03% should be used with caution in aphakic patients, in pseudophakic patients with a torn posterior lens capsule, or in patients with known risk factors for macular edema. There have been reports of bacterial keratitis associated with the use of multiple-dose containers of topical ophthalmic products. These containers had been inadvertently contaminated by patients who, in most cases, had a concurrent corneal disease or a disruption of the ocular epithelial surface [see Patient Counseling Information, (17)]. Bimatoprost ophthalmic solution, 0.03% contains benzalkonium chloride, which may be absorbed by and cause discoloration of soft contact lenses. Contact lenses should be removed prior to instillation of bimatoprost ophthalmic solution, 0.03% and may be reinserted 15 minutes following its administration. Because clinical trials are conducted under widely varying conditions, adverse reaction rates observed in the clinical trials of a drug cannot be directly compared to rates in the clinical trials of another drug and may not reflect the rates observed in practice. In clinical trials, the most frequent events associated with the use of bimatoprost ophthalmic solution, 0.03% occurring in approximately 15% to 45% of patients, in descending order of incidence, included conjunctival hyperemia, growth of eyelashes, and ocular pruritus. Approximately 3% of patients discontinued therapy due to conjunctival hyperemia. Ocular adverse events occurring in approximately 3 to 10% of patients, in descending order of incidence, included ocular dryness, visual disturbance, ocular burning, foreign body sensation, eye pain, pigmentation of the periocular skin, blepharitis, cataract, superficial punctate keratitis, periorbital erythema, ocular irritation, and eyelash darkening. The following ocular adverse events reported in approximately 1 to 3% of patients, in descending order of incidence, included: eye discharge, tearing, photophobia, allergic conjunctivitis, asthenopia, increases in iris pigmentation, and conjunctival edema. In less than 1% of patients, intraocular inflammation was reported as iritis. Systemic adverse events reported in approximately 10% of patients were infections (primarily colds and upper respiratory tract infections). The following systemic adverse events reported in approximately 1 to 5% of patients, in descending order of incidence, included headaches, abnormal liver function tests, asthenia and hirsutism. The following adverse reactions have been identified during postapproval use of bimatoprost ophthalmic solution, 0.03%. Because these reactions are reported voluntarily from a population of uncertain size, it is not always possible to reliably estimate their frequency or establish a causal relationship to drug exposure. The reactions, which have been chosen for inclusion due to either their seriousness, frequency of reporting, possible causal connection to bimatoprost ophthalmic solution, or a combination of these factors, include: abnormal hair growth, asthma-like symptoms, dizziness, dyspnea, eyelid edema, hypersensitivity reaction including signs and symptoms of eye allergy and allergic dermatitis, hypertension, nausea, and periorbital and lid changes including deepening of the eyelid sulcus. Risk SummaryThere are no adequate and well-controlled studies of bimatoprost ophthalmic solution, 0.03% administration in pregnant women. There is no increase in the risk of major birth defects or miscarriages based on bimatoprost postmarketing experience.In embryofetal developmental studies, administration of bimatoprost in pregnant mice and rats during organogensis, resulted in abortion and early delivery at oral doses at least 33 times (mice) or 94 times (rats) the human exposure at the recommended clinical dose (based on blood area under the curve [AUC] levels). These adverse effects were not observed at 2.6 times (mice) and 47 times (rats) the human exposure at the recommended clinical dose.In pre/postnatal development studies, administration of bimatoprost to pregnant rats from organogenesis to the end of lactation resulted in reduced gestation length and fetal body weight, and increased fetal and pup mortality at oral doses at least 41 times the human systemic exposure at the recommended clinical dose (based on blood AUC levels). No adverse effects were observed in rat offspring at exposures estimated at 14 times the human exposure at the recommended clinical dose (based on blood AUC levels).Because animal reproductive studies are not always predictive of human response bimatoprost ophthalmic solution, 0.03% should be administered during pregnancy only if the potential benefit justifies the potential risk to the fetus.DataAnimal DataIn an embryofetal development rat study, abortion was observed in pregnant rats administered bimatoprost orally during organogenesis at 0.6 mg/kg/day (94 times the human systemic exposure at the recommended human ophthalmic dose [RHOD], based on AUC). The No Observed Adverse Effect Level (NOAEL) for abortion was 0.3 mg/kg/day (estimated at 47 times the human systemic exposure at the RHOD, based on AUC). No abnormalities were observed in rat fetuses at doses up to 0.6 mg/kg/day.In an embryofetal development mouse study, abortion and early delivery were observed in pregnant mice administered bimatoprost orally during organogenesis at doses greater than or equal to 0.3 mg/kg/day (33 times the human systemic exposure at the RHOD, based on AUC). The NOAEL for abortion and early delivery was 0.1 mg/kg/day (2.6 times the human systemic exposure at the RHOD, based on AUC). No abnormalities were observed in mouse fetuses at doses up to 0.6 mg/kg/day (72 times the human systemic exposure at the RHOD, based on AUC).In a pre/postnatal development study, treatment of pregnant rats with bimatoprost orally from gestation day 7 to lactation day 20 resulted in reduced gestation length, increased late resorptions, fetal deaths, and postnatal pup mortality, and reduced pup body weight at doses greater than or equal to 0.3 mg/kg/day. These effects were observed at exposures at least 41 times the human systemic exposure at the RHOD, based on AUC. The NOAEL for postnatal development and mating performance of the offspring was 0.1 mg/kg/day (estimated at 14 times the human systemic exposure at the RHOD, based on AUC). Risk SummaryIt is not known whether topical ocular treatment with bimatoprost ophthalmic solution, 0.03% could result in sufficient systemic absorption to produce detectable quantities in human milk. In animal studies, bimatoprost has been shown to be present in breast milk of lactating rats at an intravenous dose (i.e., 1 mg/kg) 324 times the RHOD (on a m2g/m basis), however no animal data is available at clinically relevant doses.The developmental and health benefits of breastfeeding should be considered along with the mother’s clinical need for bimatoprost ophthalmic solution, 0.03% and any potential adverse effects on the breastfed child from bimatoprost ophthalmic solution, 0.03%. No information is available on overdosage in humans. If overdose with bimatoprost ophthalmic solution, 0.03% occurs, treatment should be symptomatic. In oral (by gavage) mouse and rat general toxicity studies, doses up to 100 mg/kg/day did not produce any toxicity. This dose expressed as mg/m2 is at least 70 times higher than the accidental dose of one bottle of bimatoprost ophthalmic solution, 0.03% for a 10 kg child. Bimatoprost ophthalmic solution, 0.03% is a synthetic prostamide analog with ocular hypotensive activity. Its chemical name is (Z)-7-[(1R,2R,3R,5S)-3,5-Dihydroxy-2-[(1E,3S)-3-hydroxy-5-phenyl-1-pentenyl]cyclopentyl]-5-N-ethylheptenamide, and its molecular weight is 415.58. Its molecular formula is C25H37NO4. Its chemical structure is:Bimatoprost is a powder, which is very soluble in ethyl alcohol and methyl alcohol and slightly soluble in water. Bimatoprost ophthalmic solution, 0.03% is a clear, isotonic, colorless, sterile ophthalmic solution with an osmolality of approximately 290 mOsmol/kg. Bimatoprost ophthalmic solution, 0.03% contains Active: bimatoprost 0.3 mg/mL; Inactives: benzalkonium chloride 0.05 mg/mL; disodium hydrogen phosphate heptahydrate; citric acid monohydrate; sodium chloride; and water for injection. Sodium hydroxide and/or hydrochloric acid may be added to adjust pH. The pH during its shelf life ranges from 6.8 - 7.8. AbsorptionAfter one drop of bimatoprost ophthalmic solution, 0.03% was administered once daily to both eyes of 15 healthy subjects for two weeks, blood concentrations peaked within 10 minutes after dosing and were below the lower limit of detection (0.025 ng/mL) in most subjects within 1.5 hours after dosing. Mean Cmax and AUC0-24hr values were similar on days 7 and 14 at approximately 0.08 ng/mL and 0.09 ng•hr/mL, respectively, indicating that steady state was reached during the first week of ocular dosing. There was no significant systemic drug accumulation over time.DistributionBimatoprost is moderately distributed into body tissues with a steady-state volume of distribution of 0.67 L/kg. In human blood, bimatoprost resides mainly in the plasma. Approximately 12% of bimatoprost remains unbound in human plasma.MetabolismBimatoprost is the major circulating species in the blood once it reaches the systemic circulation following ocular dosing. 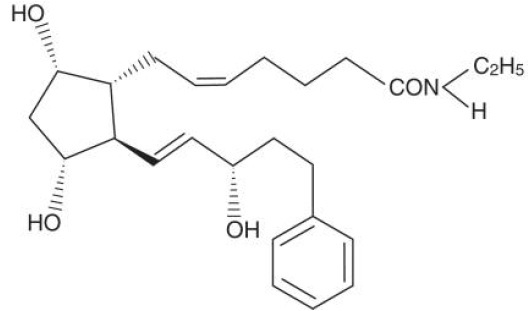 Bimatoprost then undergoes oxidation, N-deethylation and glucuronidation to form a diverse variety of metabolites.EliminationFollowing an intravenous dose of radiolabeled bimatoprost (3.12 mcg/kg) to six healthy subjects, the maximum blood concentration of unchanged drug was 12.2 ng/mL and decreased rapidly with an elimination half-life of approximately 45 minutes. The total blood clearance of bimatoprost was 1.5 L/hr/kg. Up to 67% of the administered dose was excreted in the urine while 25% of the dose was recovered in the feces. CarcinogenesisBimatoprost was not carcinogenic in either mice or rats when administered by oral gavage for 104 weeks at doses of up to 2 mg/kg/day and 1 mg/kg/day respectively (at least 192 and 291 times the human systemic exposure at the RHOD, respectively, based on blood AUC levels).MutagenesisBimatoprost was not mutagenic or clastogenic in the Ames test, in the mouse lymphoma test, or in the in vivo mouse micronucleus tests.Impairment of FertilityBimatoprost did not impair fertility in male or female rats at doses up to 0.6 mg/kg/day (at least 103 times the human systemic exposure at the RHOD, based on blood AUC levels). In clinical studies of patients with open angle glaucoma or ocular hypertension with a mean baseline IOP of 26 mmHg, the IOP-lowering effect of bimatoprost ophthalmic solution, 0.03% once daily (in the evening) was 7 to 8 mmHg. Bimatoprost ophthalmic solution, 0.03% is supplied sterile in opaque white low density polyethylene bottle which is closed with white low density polyethylene nozzle and then with turquoise colored high density polyethylene cap in the following sizes: 2.5 mL fill in a 5 mL container - NDC 68083-295-01 5 mL fill in a 10 mL container - NDC 68083-296-01Storage: Store at 2° to 25°C (36° to 77°F). Potential for PigmentationAdvise patients about the potential for increased brown pigmentation of the iris, which may be permanent. Also inform patients about the possibility of eyelid skin darkening, which may be reversible after discontinuation of bimatoprost ophthalmic solution, 0.03%.Potential for Eyelash ChangesInform patients of the possibility of eyelash and vellus hair changes in the treated eye during treatment with bimatoprost ophthalmic solution, 0.03%. These changes may result in a disparity between eyes in length, thickness, pigmentation, number of eyelashes or vellus hairs, and/or direction of eyelash growth. Eyelash changes are usually reversible upon discontinuation of treatment.Handling the ContainerInstruct patients to avoid allowing the tip of the dispensing container to contact the eye, surrounding structures, fingers, or any other surface in order to avoid contamination of the solution by common bacteria known to cause ocular infections. Serious damage to the eye and subsequent loss of vision may result from using contaminated solutions.When to Seek Physician AdviceAdvise patients that if they develop an intercurrent ocular condition (e.g., trauma or infection), have ocular surgery, or develop any ocular reactions, particularly conjunctivitis and eyelid reactions, they should immediately seek their physician’s advice concerning the continued use of bimatoprost ophthalmic solution, 0.03%.Use with Contact LensesAdvise patients that bimatoprost ophthalmic solution, 0.03% contains benzalkonium chloride, which may be absorbed by soft contact lenses. Contact lenses should be removed prior to instillation of bimatoprost ophthalmic solution, 0.03% and may be reinserted 15 minutes following its administration.Use with Other Ophthalmic DrugsAdvise patients that if more than one topical ophthalmic drug is being used, the drugs should be administered at least five (5) minutes between applications.